While the world kept asking questions and Indians remained puzzled, the Noida-based startup, promising a Rs.251 “Make in India” smartphone, Freedom 251, on Friday claimed to have received nearly 5 crore registrations in just two days of opening up for online pre-orders. 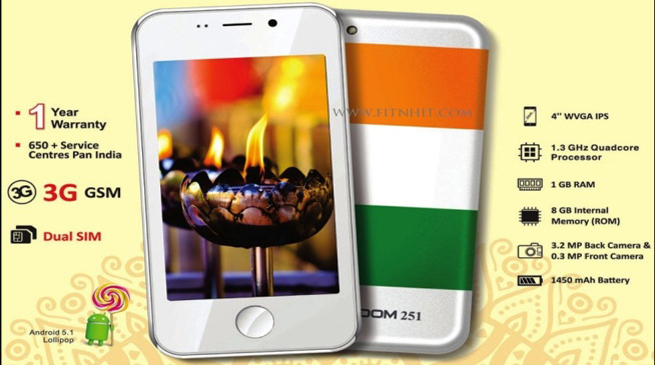 Ringing Bells Pvt Ltd president Ashok Chadha said that since the company will hand over 25 lakh “Freedom 251” phones to the people who have registered for it online, the firm is now considering whether to stop the registration process or not as there are two more days left to pre-order the phone till 8 p.m. on February 21. “The pre-booking numbers we received are sheer humongous. I am happy that so many Indians have responded to our ‘Make in India’ smartphone call. Now the onus is on us to deliver on the promise and I am hopeful that we will be able to start delivery latest by April 10 and finish well before the June 30 deadline,” Chadha informed. The smartphones will be handed over via first-come-first-serve basis, he announced. According to Chadha, the company is looking to set up two more units – one each in Noida and Uttarakhand. But how fast the company is going to start the manufacturing and churn out devices is a big question. Chadha further said that while the manufacturing cost of the phone is high, it will be recovered through a series of measures like economies of scale, innovative marketing, reduction in duties and creating an e-commerce marketplace. However, how well the little-known firm is placed to achieve this task is yet to be known. “We are only looking at slim margins here. The aim is to first empower people especially from rural parts of the country to connect with the mainstream with this cheap yet powerful smartphone,” he added. Reacting to the controversy that all the icons of the built-in app were almost a replica of Apple’s iOS icons, he said the phones that were shown just as samples during the launch on Wednesday were “of some other brand” and the company will provide people “Freedom 251” with all promised features. With such tall promises, the road ahead for the “Freedom 251” makers is not easy though. The Indian government is keeping a close watch on its four-day booking offer that started from 6 a.m. on Thursday. The Indian Cellular Association has also written to the telecom ministry, urging the government to get to the bottom of the issue as selling a smartphone this cheap is not possible. Earlier on Thursday, Ringing Bells claimed to have received 30,000 confirmed orders and over six lakh hits per second on its website on the first day. But hours later, the firm stopped taking orders after its servers crashed owing to a huge rush to book the device online. The much-hyped launch of the world’s cheapest smartphone “Freedom 251” was also thrown into disarray as there was utter chaos at the company’s Noida-based head office on Thursday.